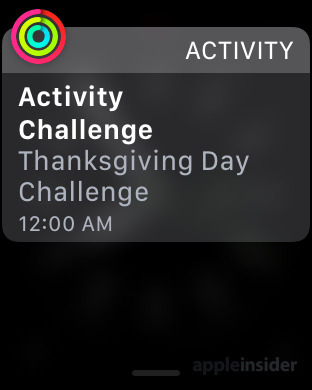 Apple has issued a special challenge to Apple Watch wearers, offering a Thanksgiving-themed Activity achievement to those who walk, run or wheelchair a workout distance of at least 5 kilometers, or 3.1 miles. 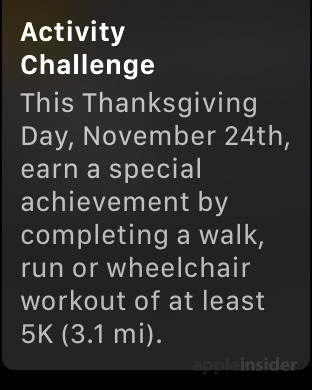 "Activity Challenge: This Thanksgiving Day, November 24th, earn a special achievement by completing a walk, run or wheelchair workout of at least 5K (3.1 mi)." 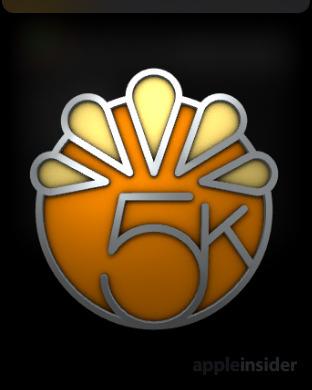 Completing the Thanksgiving task will give users a unique medal in their list of achievements in the Activity app. The challenge is not limited to Apple's Workout app for Apple Watch, as Apple noted that any app that records workouts into the iPhone Health app will qualify. Those who complete the challenge will also earn a special Messages app sticker, supporting the sticker functionality introduced earlier this year in iOS 10.